Phantoms players celebrate last season's English Premier League play-off triumph. 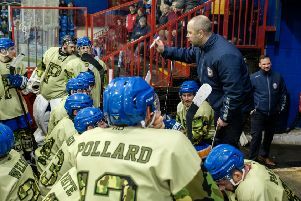 Peterborough Phantoms player-coach Slava Koulikov insists his side must build on their English Premier League play-off triumph in the forthcoming season. The city club exceeded all expectations when powering to trophy glory last term but the clock is now ticking to the start of the 2015/16 season. Phantoms start with a September 12 visit to Swindon before entertaining Basingstoke in their opening home outing at Planet Ice 24 hours later. It is likely to be the first of what Koulikov expects to be many tough weekends. Koulikov said: “It certainly won’t be an easy weekend to start and I don’t expect any of them during the season either. “You only have to look at the rosters to see how the majority of teams have strengthened during the summer and it is going to be an extremely tough league. “There will be lots of teams fighting at the top this season and of course we can be one of them if we find the consistency. We need to pick up points every weekend and we will need to avoid injuries and have a bit of luck along the way. Koulikov remains undecided on his own on-ice participation in the new campaign. He will take no part in three pre-season challenge clashes to run the rule over the 13 forwards already at his disposal. He is particularly keen to monitor the progress of young prospects Brad Moore, Connor Stokes, James White and Martins Susters as Phantoms host newly-formed Elite League side Manchester Storm (August 30) ahead of away and home ‘Ashes’ dates against arch-rivals Milton Keynes (September 5 & 6). Koulikov is in the process of finalising the club’s pre-season training schedule. It is likely to begin in earnest in mid-August and again include an off-ice bonding camp. Koulikov has confirmed his father, Aleksandr, will not be returning this season due to taking up a coaching position on the continent. Phantoms have 54 regular league games this season. They play nine teams six times. Hull have joined the league this season. Phantoms have back-to-back games against local rivals Milton Keynes on December 26 & 27. The regular season finishes with a home game against Sheffield on March 20.